Does your cat constantly wake you at night by playing on the bed, lobbying to be fed, or soliciting cuddle time when all you want to do is sleep? Your good night's sleep is extremely important to your health and shouldn't be interrupted by your kitty. It can be even worse for people with sleep disorders, who may have problems going back to sleep after being awakened by a demanding cat. There's no need to suffer from cat-related sleep deprivation, though. If medication or pharmaceutical sleep aids aren't an option for you, experiment with one or more tried-and-true tactics for getting a full night's sleep and still give your kitty the attention it craves. Why Does Your Cat Wake You at Night? In their natural habitats, cats are nocturnal creatures. They sleep almost all day and play or hunt all night. Although your pet cat is probably less nocturnal and more crepuscular, meaning it's most active at dawn and dusk (and thus more or less adjusted to your schedule), there are a few reasons why your kitty might be prompted to wake you up in the dead of the night. 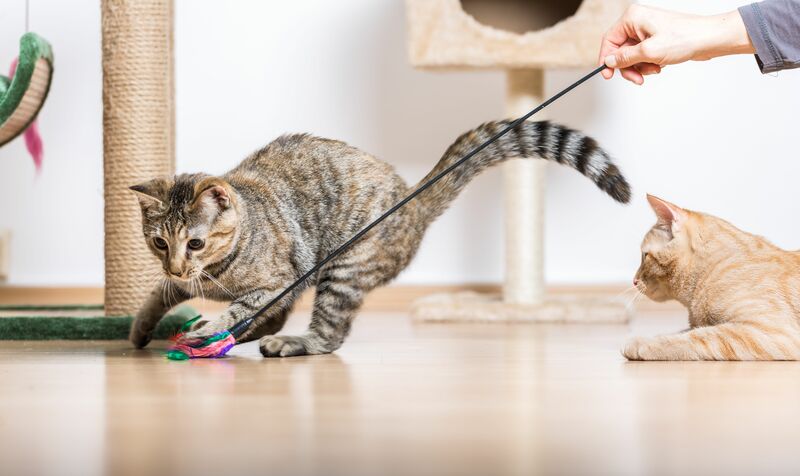 It may not be getting enough stimulation, enrichment, and exercise during its active periods, so while you're dropping off, your cat may be fully awake and looking to play. If your cat spends most of its active time home alone while you're at work or elsewhere, it may be bored and looking for companionship. Your kitty is hungry or wants a midnight snack or a special treat. Your cat's schedule isn't in sync with yours anymore. Your kitty's bedding has been disturbed. Take note if your cat is old and/or its nighttime friskiness is new or unusual behavior. Whenever your cat exhibits off behavior, wakes at night for no reason, seems to be sickly, or displays other symptoms, check with your vet right away. Unusual bouts of interrupted sleep can be a sign of illness, ranging from a toothache to something even more serious like arthritis, hyperthyroidism, or high blood pressure. There are a number of techniques that you can try to train (or retrain) your cat not to wake you up at night. Some will require some behavior modifications on the pet owners part, so make sure that all family members are on board with the changes. Before you go to bed, decide how you will react to your cat. The middle of the night is not the best time to make a decision. Help your cat to readjust its internal clock by scheduling an interactive hour-long play period about an hour before bedtime. Follow the play session with a light kitty-appropriate snack like a small treat or cube of cheese, which should leave your cat drowsy and not angling for food in the middle of the night. If your cat wakes you up anyway, ignore it. After trying this a few times, your cat will learn that it's not getting the attention it wants from you and may leave you alone. If you have a sleep disorder, it's best never to encourage your cat to sleep on your bed. This means making your bedroom off-limits at all times. Give your cat a comfortable cat bed in a spare room, a corner of the living room (with a screen for privacy), or even a bathroom. Try rubbing a bit of catnip on the bed initially to encourage the cat to use it. If your cat interrupts your sleep early in the morning by pouncing on you to seek breakfast, don't allow the kitty to train you. Tell it "No!" Then cover your head with a sheet, blanket, or a pillow, if necessary. When your own clock (internal or otherwise) tells you it's time to wake up, then feed your cat. This will teach the cat that breakfast is served on your schedule. Cats don't like surprises and are most happy when their household revolves around a predictable schedule. Giving your cat a set time for food, exercise, interactive play, grooming, and petting will go a long way toward maintaining its well-being and giving you a good night's sleep, every night. If you find yourself awakened by a noisy or annoying cat, try to create a peaceful environment to help you (and your cat) get some restful sleep. Again, make sure that all family members are aware of the steps you are taking. If you ignore your cat, but someone else feeds in the middle of the night, the ignoring is for nothing. Even if you close your bedroom door to your cat, a determined feline might scratch at the door for a while, but it will eventually give up and either go to sleep or find some other activity. You can help prevent damage to your door by either mounting a vertical scratch pad on it, trimming your kitty's nails regularly,​ or having your vet fit your cat with plastic nail caps like Soft Claws. A number of commercial products are available that play soothing sounds that may help you sleep (with your cat on the other side of the door). You can select from bird sounds, ocean or waterfall sounds, or just white noise. Earphones or earbuds will help amplify and enhance the sleep-inducing effects. Try to prevent those pouncing, biting attacks on your toes at night by using room-darkening shades to completely darken your room. Replace any digital or fluorescent-dial clocks by the bedside with nonilluminated versions or just use your phone. Avoid nightlights because your cat might think they're toys. Although cats can see in very low light, they can't see in total darkness and will also be more inclined to go to sleep. If all else fails and your cat's noises or scratching at the door keeps you awake, use swimmers' earplugs, which effectively seal the ear canal and should give you some relief.